The Telugu superstar Mahesh Babu has out beaten Tamil superstar Dhanush by a close margin of just one position in the prestigious Forbes India list of Top 100 Celebrities!! 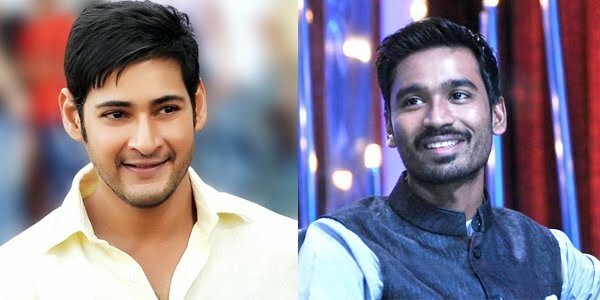 According to the latest Forbes India list of Top 100 Celebrities Mahesh Babu occupies 36th position while Dhanush stands at 37th position. What is surprising is that Mahesh Babu has even left behind South legends Rajinikanth and Kamal Haasan in the latest Forbes India List, who occupy 46 and 69th positions respectively. It may be noted that the yardstick for occupying a position in the elite The Forbes India list of Top 100 Celebrities is not just the popularity at box office or fan base on social media but is calculated after a meticulous study of a celebrities’ total earnings, Google hits, fan base, press clips, magazine covers, etc. during a particular year. For instance Rajinikanth in the Forbes India List of Top 100 Celebrities had earnings of Rs 37 crore hence he was at the 45 position but his earning declined in 2015 to Rs 25 crore hence has been shifted to 69th position. Mahesh Babu who had a mixed bag in 2014 this year hit the bull’s eye with SRIMANTHUDU, which completed a 100-day run in the theatres and garnered over Rs 200 crore at the box office. What is laudable is Dhanush’s dynamic elevation in the Forbes list from the pitiable 78th position and an earning of Rs 11 crore in 2014 to the mindboggling escalation at 37th position (almost 31 position raise) and a whopping earning of Rs 42 crores!!! Dhanush’s success is credited to the huge success of his home productions viz. Tamil film MAARI that grossed Rs 60 crore and his other film KAAKA MUTTAI not only broke box office records but fetched him the prestigious 62nd National Awards as best children's film. In addition his performance in Bollywood film SHAMITABH where he shared screen space with Amitabh Bachchan won him rave reviews. Another notable difference between the Forbes list of 2015 and 2014 is that many popular South stars like Vijay and Ajith along with director AR Murugadoss, who were present in the last year's list have failed to retain their positions. Interestingly Mozart of Madras the musical wizard AR Rahman maintained his position in the elite list. The only difference he fell from 13th position with earning of Rs 40 crore to 14th position with little drop in income to Rs 43.97 crore! Other South stars in the list include Allu Arjun (42postion) Suriya (71postion), Prabhas (77 positions). In addition stars like N Santhanam, Kajal Aggarwal, Shruti Haasan, SS Rajamouli, Ravi Teja, and Arya are the new South Indian faces to enter the list of Forbes Celeb 100 this year. STYLE! Thy name is Rajinikanth!!! The history of Indian Cinema has seen many stars like Bollywood icons Shatrughan Sinha to Raaj Kumar have been known to win the heart of the masses with their dynamic styles but none have been able to match the charismatic Style of Rajinikanth. Be it his flipping of cigarette to his signature walk to his one liners, Rajinikath’s inimitable and unparalleled style have made him the most stylish actors of Indian cinema! That’s the reason when other South stars like Kamal Hasaan, Chiranjeevi, Venkatesh Daggubati,Nagarjuna, Mohanlal, Mammootty to the young lot like Prithviraj, Rana Daggubati, Ram Charan etc failed to click in Bollywood only Rajinikanth stood tall and gave many hits like ANDHAA KAANOON, CHAALBAAZ, HUM, PHOOL BANE ANGARAY, GERAFTAAR, ROBOT etc. It may be noted Rajinikanth shared screen with Amitabh Bachchan in three films ANDHAA KAANOON, HUM and GERAFTAAR and in each film he stood out exceptionally making his very own distinct mark. The greatness of Thalaivar Rajinikanth can be gauged from the fact that he not only donated huge amount for Chennai flood but also cancelled his birthday and called all his fans to celebrate the day helping the relief operation of Chennai flood victims. Raaga.Com wishes Rajinikanth Sir Birthday greetings and calls our readers to celebrate the day by doing at least one noble deed … be it as simple as serving water to the thirsty birds on your balconies.